I was sooo close to naming these "Fat Husband" cookies as a play on the Ben and Jerry's Chubby Hubby flavor. The peanut butter is there. The chocolate is there. The pretzels are there. They have the same delicious sweet/salty/malty goodness. But after seeing my husband go back for his fourth cookie in a row, however . . . I decided against it. I can't imagine enjoying any dessert I was addicted to called "Fat Wife _______ "
And oh, are these cookies are addictive. Addictive in a way that only peanut butter and chocolate can be. Addictive in their mix of crunchiness and chewiness. Addictive in the way the sweet chocolate balances the salty peanut butter pretzels. Addictive in the oh-my-goodness-did-I-just-eat-five-cookies kind of way. Just try to keep from eating them all in a single sitting. Using your hands, break pretzels into small pieces. Place in a large bowl. Add flour, baking soda, salt and malt powder to the bowl containing pretzel pieces. Stir to combine. In the bowl of an electric mixer fitted with a paddle attachment, cream butter and sugar until fluffy. Add peanut butter and beat until smooth. Scrape down the bowl and add the eggs, one at a time, while mixer is running at medium speed. Scrape down bowl and beat until smooth. Turn mixer to low speed and beat in flour mixture. You may need to mix in the last bit of flour by hand because the dough will be stiff. Stir in chocolate chips. Cover the mixer bowl with plastic wrap and refrigerate 20 minutes or until dough is firm. Drop tablespoon sized dough balls onto a baking sheet and flatten slightly into disks with your palm. Sprinkle tops with kosher salt and bake 14-16 minutes, or until tops are just beginning to brown. Let cookies cool in pan 5 minutes, them remove to a wire rack and cool completely. That's nice you decided against that name! lol I know I'd be hard pressed to stop eating these because I love that sweet-salty thing. These cookies look just perfect for me! 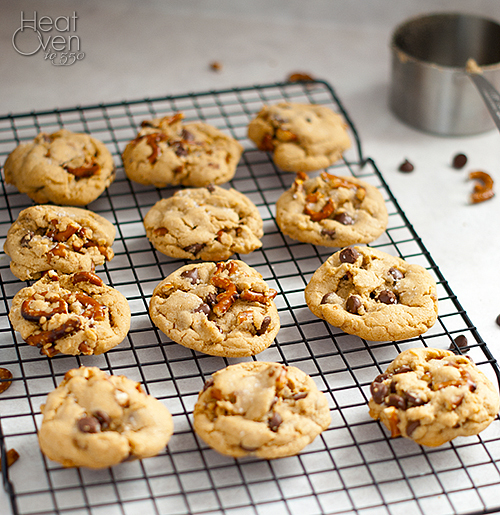 Hahaha, fat husband cookies is a great name ;) these sound amazing! I love Chubby Hubby- it's my favorite flavor so I know I'd love these too. Holy Moly Nicole...I would have totally gone with Fat Husband...lol Yum to these though. LOL, that's such a funny story. I guess I can see why you decided against Fat Husband :) Whatever you call them, these cookies sound fantastic. So much salty/sweet goodness! That would have been a really name for the cookie. 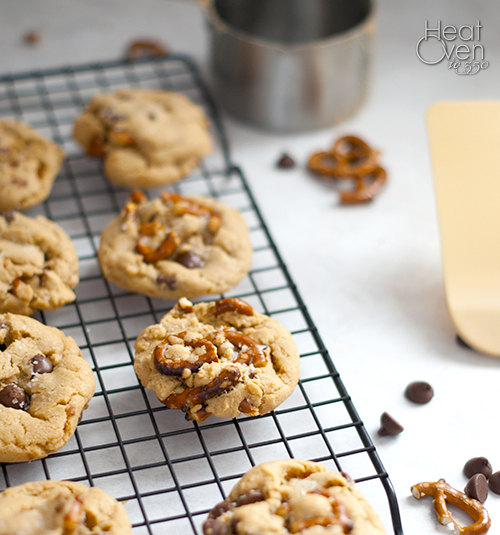 I love pretzels in cookies so I'm in! Yummm I love pretzels and chocolate. Sooo good! Um, you had me at chocolate, pretzels AND peanut butter! Those look delicious Nicole! Saw these on Pinterest and had to leave you a comment. They look positively addictive. I am sure your husband is grateful you did not name them Fat Husband! Sweet and salty is my Kryptonite. Whoops, forgot to ask, what is malt powder? What brand are you using? Malt powder is malted milk powder. It is the same stuff that gives malted milk shakes or malt balls their distinctive flavor. You can find it in the grocery aisle, usually with creamers or hot chocolates. I think the Carnation brand is usually the most common. You can always leave it out or substitute flour if you can't find it.